Rural hospitals operating in the U.S. have a higher risk of mortality — closure — than other hospitals in America. The U.S. health care landscape is littered with examples of health disparities among the nation’s health citizens – for example, women’s lower access to heart-health care, Latinos’ higher rates of Type 2 Diabetes, and African-Americans’ greater risks of stroke, many cancers, maternal mortality, and many other causes of mortality and diminished health. A report from iVantage, Rural Relevance – Vulnerability to Value, documents the fiscally challenging environment for rural hospitals in America. There are at least 673 facilities at-risk of closure in rural areas, which cover nearly 12 million patient encounters, 99,000 healthcare jobs, an additional 137,000 community jobs lost, and a $277 bn loss to the U.S. GDP over 10 years. iVantage presented this research in early February 2016 to the 27th Rural Health Policy Institute. The map illustrates the vulnerability of rural hospitals by the red color: note that the deepest vulnerabilities lie in the southern US (which also struggles with primary care access challenges), along with the western states of California and Nevada. 35% of rural hospitals are operating at a loss. iVantage’s report is based on their Hospital Strength INDEX benchmark, which is composed of nine performance pillars: outpatient market share, inpatient market share, market risk, cost, charge, quality, outcomes, patient perspective, and financial stability. Health Populi’s Hot Points: Some 671 rural hospitals in this report serve communities with the highest healthy disparities in the U.S. iVantage measured 12 health disparities in their INDEX, including adult obesity rates, child poverty rates, unemployment, smoking, costs, uninsured, housing problems, dental providers, graduation rate, mental health providers, diabetes screening rates, and primary care physicians. There is a relationship between the health of the population and the health of a hospital. 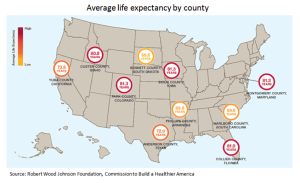 See the third diagram, a map produced by the Robert Wood Johnson Foundation, which indicates average life expectancy by county. Most of the lowest achievers by state are also those areas noted as vulnerable by iVantage. I’m speaking tomorrow at the annual meeting convened by the American Hospitals Association for the Rural Healthcare Leadership Conference. My theme: how consumers — patients, caregivers, people — can and must co-create health for themselves, their families, and ultimately as health citizens in communities. Health disparities start with the N of 1 but they are the challenge for all U.S. Health citizens. Public policies must bake in health at every level — from food legislation and city zoning and planning to early childhood education and, yes, healthcare. The intersection of population health and provider "health", needs further investigation. We are eager to dive deep into the biggest challenges and opportunities our Health Disparities INDEX has made obvious. Let me know if you have questions you would like to pose for my team.